The first webcam, developed in 1991, was born out of necessity. A computer graduate student was avoiding having to walk down several flights of stairs to find an empty coffee pot. So he and his fellow sleep deprived, coffee craving students pieced together the first webcam. Now, they could devote a corner of their desktop screen real estate to the important status of the caffeine-giving java pot. And with that, the webcam was born. I had my first webcam about five years ago. I found the camera difficult to use. The camera had a low frame rate, and I was never centered in the frame. The software was clunky to use, and I couldn’t even easily capture a still picture with the camera. Quite honestly, I never was able to video conference with another user, and lost interest. However, the allure was still great. I grew up watching “The Jetsons,” and the technology for easy videoconferencing has always been just “a few years away” (just like speech recognition). Has the webcam hardware caught up with today’s powerful computers? Can I harness the transmission power of broadband to finally make my video call? I am ready to give it another try. 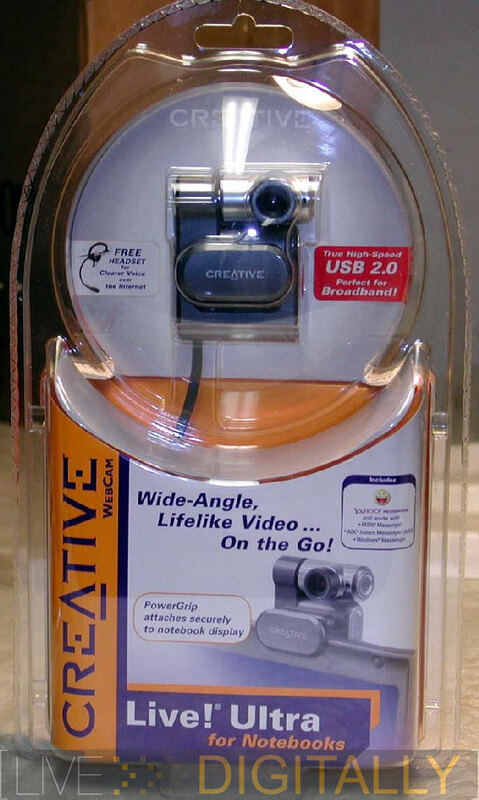 Creative makes a variety of computer electronic products centered on audio sound cards, MP3 players, speakers, and webcams. Today, we’ll be looking at the Creative WebCam Live! Ultra for Notebooks. This is a complete solution that is designed for the mobile notebook user looking to video conference, as well as some other applications. Read on to see if video conferencing has arrived, and if this is the right hardware solution. The following items are included in the Creative WebCam Live! Ultra for notebooks. The package retails for $99. The travel pouch immediately caught my attention. As far as I’m concerned, if it says notebook on the package, then the device should be ready to travel in a notebook bag. The pouch was constructed out of a nylon parachute type of material. This is great to keep electronics dry, but I was immediately concerned that the lens would get scratched. My concern was ameliorated when I looked inside the pouch and saw it was lined with a smooth cloth inside. I thought that if they designed the webcam as well as the pouch, this would be excellent product. I was impressed with this level of attention to detail. The centerpiece of the system is the camera itself. It is designed to be compact in size, and has attached a 3.3 foot USB cord. The Creative WebCam Ultra for Notebooks features a wide angle lens, with an f = 2.0 value, which is good for low lighting situations. The wide angle lens claims a 72 degree viewing angle, which is 50% greater than other webcams, and means it is easier to keep you in the frame. The lens is screwed in or out to adjust the focus. The camera is rated for 640 x 480 (~1/3rd megapixel) at 30 frames per second. The camera can software interpolate up to 1.3 megapixels for still pictures. To the right of the lens is a green LED to indicate the webcam is active. The lens is mounted on a rotating barrel to control the vertical aspect of the webcam. The webcam has a “PowerGrip” to attach it to the top rim of a notebook screen. It has a spring mechanism, and rubberized strips to clamp securely without scratching your laptop. For the best image quality, the camera uses a CCD sensor. Most digital cameras use a CCD sensor to digitize the images. Some webcams use a cheaper CMOS sensor, but reportedly, the colors are not as rich. Creative definitely did not cut corners here. 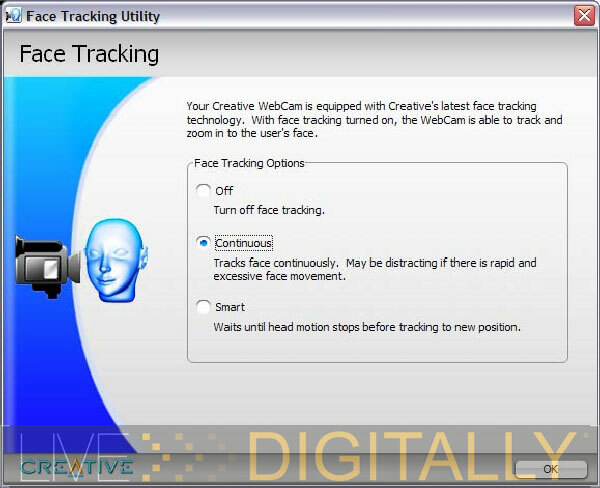 The WebCam Ultra puts its 4x digital zoom to good use with its “Face Tracking” utility. This makes it much more likely that your face will be well centered and you won’t need to continuously adjust the webcam, and your position, which is VERY distracting during a video conference. It functions in one of three modes: off, continuous, and smart. I found continuous to work the best and it did an excellent job of keeping me centered, particularly in the horizontal axis. It’s real neat to see the digital zoom working to keep your face centered. This is a key technology that works well, and it should become a standard feature for webcams. Creative includes a wireless headset in the package. It reminds me of the hands free headset from my cell phone. 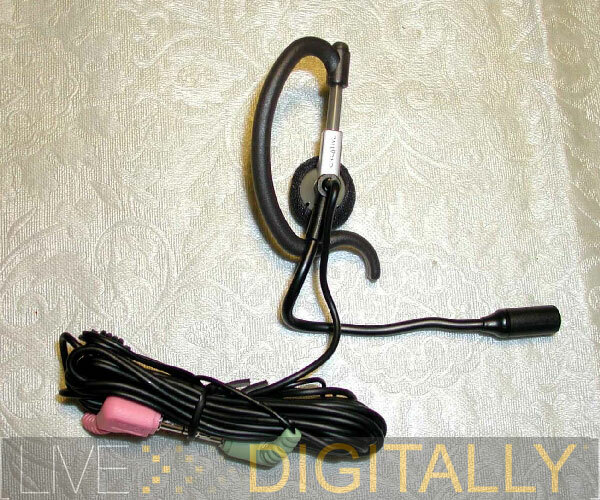 It is an over the ear design, with a short boom microphone that is adjustable. I found that it stayed in place and was comfortable. It connects to your notebook via two mini RCA plugs: one for the headset speaker, and the other for the microphone. They are color coded to match the audio plugs on your computer. While this solution is not as compact as having the microphone in the webcam itself, it does offer an advantage. Namely, when you have a microphone and speakers nearby, you can get feedback, and this placement avoids this problem. An additional advantage is that you will have more privacy in your conversation, and don’t need to speak as loudly for your voice to be picked up. While not the most compact solution, I believe this is a better sounding solution at both ends. Also, it looks very hi-tech to be on the feed with your wireless headset on! While the hardware part of the package impressed me, the software package is also outstanding. Several applications extend the capabilities of Creative’s WebCam Ultra, and make it even more useful. I was less than thrilled to see that the “Free AOL” shortcut was installed without my permission during software installation. This is rather annoying, and it shouldn’t just install itself. I’ll detail below the other useful components of this otherwise outstanding software package that maximizes the potential of Creative’s WebCam. 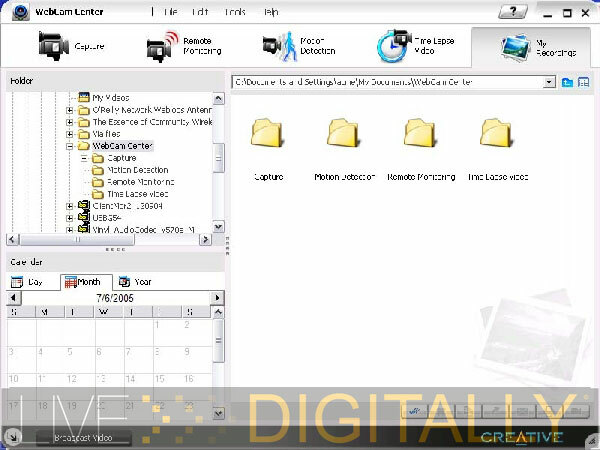 The first component is Creative’s WebCam Center. 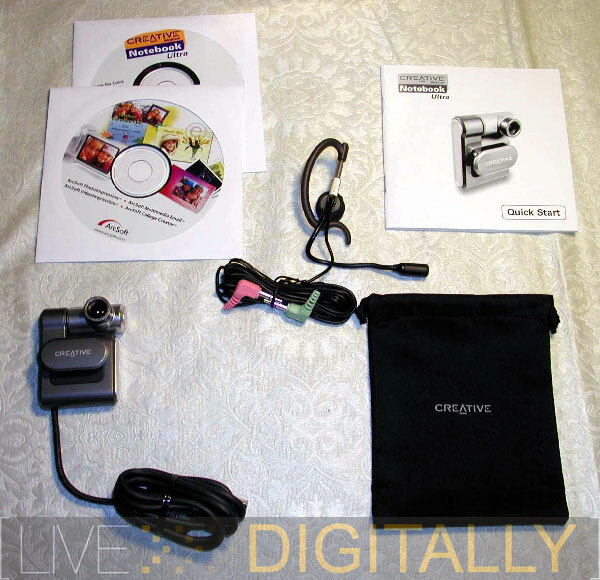 This is supplied with other Creative WebCams as well. It includes utilities for video capture, remote monitoring, motion detection, and for time lapse video. With “Capture,” a video and audio stream will be saved as a file. A still image can also be grabbed in a JPEG or BMP format. With “Motion Detection” the camera will only capture an image when there is motion across the field of view. The image can be saved to the hard drive, or emailed to an account. This is a useful for low cost, high tech security solution. With “Remote Monitoring” you can set up the webcam to grab an image at a preset interval, and post it on your website. This is popular, and if you look around, you’ll see this on many websites. It’s great to be able to have the power to do this. Now you can have your own “coffee cam” if you wish. The last application in the WebCam Center is the “Time Lapse Video” application. This allows a series of pictures taken at preset intervals to be stored as a video. This would make a neat science project to speed up a plant growing, for example. Some folks stamp the pictures with the date/time and use this to record the battery life of their MP3 player. Finally, there’s a playback utility to view your videos which get organized in a folder by date. If Creative’s product only came with the excellent WebCam Center as the software package, I would be satisfied. But wait, there’s a lot more…. The next piece of software is ArcSoft’s Collage Creator. This software is only indirectly related to the webcam, but is part of the package. At first glance, it looks ideally suited for ages 6 to 11, but I will admit I not only enjoyed it, but found it useful as well. The interface is very simple. 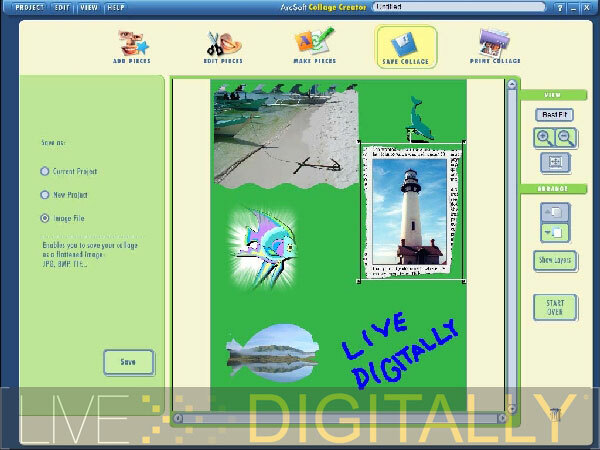 Using images from the program (photos and clip art), the webcam, or your collection, the goal is to make a collage. The images can be easily resized and positioned, overlapping is possible. The images can be customized with a choice of border enhancements. You can free draw, and put in text as well. The output can be saved as a single JPEG file for archiving or printing. 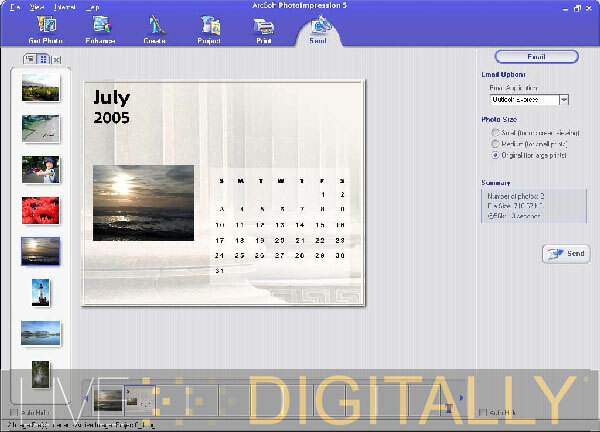 This program is ideal for making a digital scrapbook, or printing a page for a scrapbook. While this could all be accomplished in Photoshop, it would take me a lot longer than the project above which took only about 5 minutes, and was certainly more entertaining! The next included program is ArcSoft’s PhotoImpression 5. This is a combination photo editing and organizing program. The photo editing is advanced amateur level, with functions including rotate, mirror imaging, text, blur/sharpen, cropping, and color as well as brightness adjustments. There are drawing tools, a smudge feature, and erasing functions also. The two included projects are for a photobook, and a calendar. Finished images can be printed, saved, emailed, or shown as a slide show, all from within the program. While many users will already have a favorite program for image editing duties, PhotoImpression 5 is more robust than the included features in Windows, and will be a useful addition for some users. The next included software program is VideoImpression, version 2. This is an amateur video editing program. I found the program ideal for an advanced amateur with a simple interface, and a robust series of options. 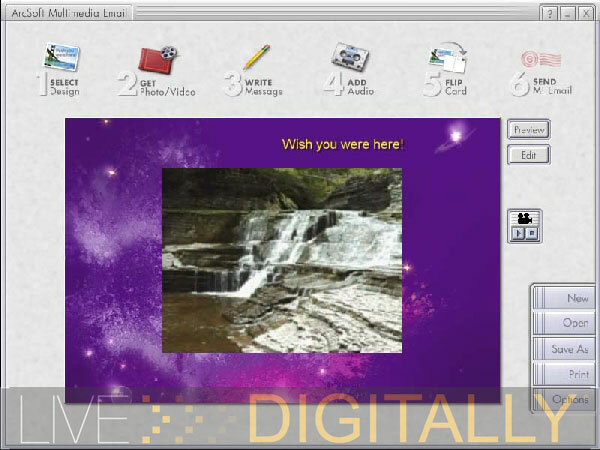 The program can handle still images, video clips (from the webcam) and audio files. Then transitions, text and even narration are added to make the video look more polished. VideoImpression can also function to make a slideshow out of a series of still images. The movie is finally produced. It can be made into a video file (avi, mpeg1, wmf, or even QuickTime), emailed as an executable file, or sent to a digital camcorder or VCR if you have the appropriate hardware. The final option is to save it on a CD in one of the previous formats, or as a videoCD. Unfortunately, the likely popular option of saving the video to a DVD disc for playing in a set top player is not available. Overall, this is a useful program, with enough power to create an attractive video. 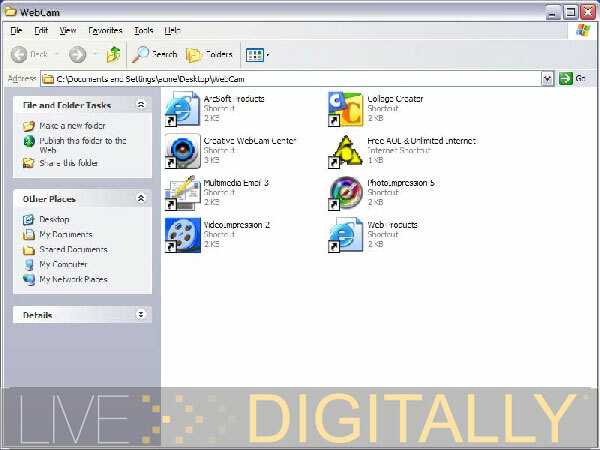 The last piece of software is ArcSoft’s Multimedia Email which most closely ties into the webcam. Suppose you wish to send a video greeting to someone who doesn’t have their own webcam. No problem! The MultiMedia Email comes with a ton of designs themed around popular greeting card topics such as get well, birthday, new baby, and holidays. Next, you add the video from the webcam, or a still image. Then your message is written in your choice of fonts and colors with settings for size, shadow and intensity. Audio, if not already in your video clip, can be added separately. The flip side of the card is finished with sending info, and a clip art stamp of your choosing. The project is than saved as a Windows executable file, or for the Mac crowd, a QuickTime file. Because it is an executable file, even the most computer inept relative will be able to view your greeting, because after a click, it automatically plays- no special player, codec, or anything else required. This is about as foolproof as it gets! This is the most valuable piece of software in the package, as now you can easily send videos to folks without a webcam, and they can benefit from this technology. With that background in mind, I was ready for my video phone call. I decided to video call BigToe, our chief here at Live Digitally. Unfortunately, I was on a dial up connection, and he was on broadband. I used the included headset for the audio end of things. We both instant message with Yahoo. 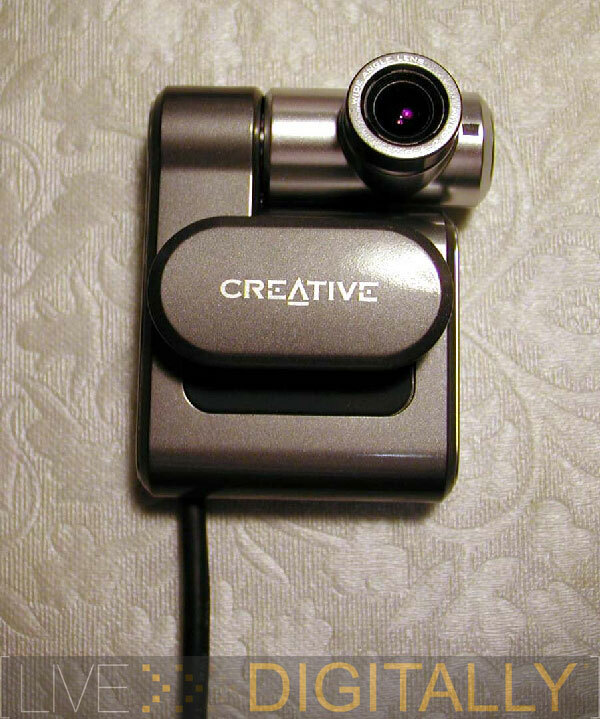 Creative’s webcam includes the Yahoo IM software, but it will also work with AOL’s and MSN’s IM client. We both were on our computers, online, running the IM software. I eagerly hit the video icon with the camera plugged in, and adjusted my headset. In a few short seconds, I was broadcasting my video, and Jeremy had accepted it. Needless to say, over a dial up connection, the video frame rate was s-l-o-w, and the audio was out of sync. What was encouraging was that we linked up on the 1st try! While the colors were not perfect, this was very cool. And let’s not forget that this was cross country. Jeremy told me that the audio was muffled. We were so out of sync that he would see me starting to type, as the completed text message reached him. In all fairness, I was on a slower dial up connection, at the maximum 640 x 480 resolution, and he was behind a corporate firewall on the opposite side of the country. I went into my microphone settings, and found that my volume was only at 50%. This was set up to the maximum. I now attempted a video call with a cable modem broadband connection at both ends. It was also accomplished using Yahoo’s IM software. It was accomplished with a minimum of fanfare, and the link up was smooth. My contact described the video as above average, with only occasional lags in the audio. He described the audio as clear, with a minimum of hiss and noise. Mission: Accomplished! You can judge for yourself the quality of the video. I’ve put together a sample, shot with ambient lighting that is adequate for reading. The compression process makes the video considerably worse than it was transmitted at, but it gives some idea of the audio. It was produced using the included VideoImpression software so it showcases it as well. The road warrior with a need for video conferencing on the move is the ideal candidate for Creative’s WebCam. This compact device travels well, and provides high quality video. While not quite being there, it may be good enough that he or she may not need to be on the road so much. The gadget guru will also want this in their bag. He or she (and their kids) will have many rainy days worth of fun playing with all the included features and software. With so much included software, they won’t run out of things to do anytime soon. This cam is LD Approved. 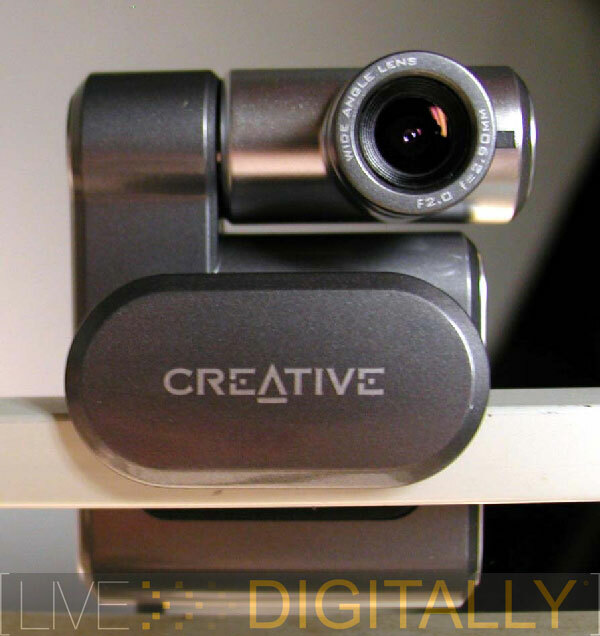 Creative’s WebCam Ultra for Notebooks is a premium device for the power notebook computer user. While not adding much weight to your laptop bag, it adds a host of functionality with the included hardware and software. I especially liked the MultiMedia Email application. Videoconferencing is easier than ever now that it is “piggybacked” onto instant messaging. The WebCam Ultra for Notebooks is “LD Approved,” don’t leave home without yours. I consider it an essential notebook accessory. Special thanks to Creative for supporting this review.